"How opposed are you to grand theft auto? " NICKNAME: Alice, never really liked the name Mary. CHECK THIS OUT: Seeing segments of the future, though they can change. OUTER BEAUTY: Alice is best described as being petite and pixie-like. She also has a graceful gait. Her hair is remarkably spiky, and often kept short. She is also very pale. 001.Jasper Whitlock Hale Cullen because he is her other half, and she would be incomplete without him. 002. My family, or clan, because they have blessed her with an eternal family, one that will not be forgotten. 003.Shopping, because its so much fun! 004. Dressing Bella up, because she usually doesn't take care of herself fashionably, but don't tell her that, Alice loves her no matter what she wears. 005. Music, Alice loves how it reaches out to the soul, and it sounds really nice. 001. I dislike the Volturi, though the reason should be obvious. 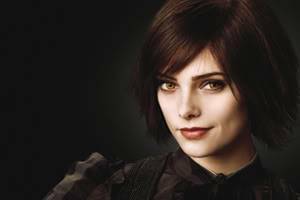 They are supposed to be enforcing the law, but she thinks Aro goes around handpicking only the "best" vampires, and creating a diplomacy. 002. Werewolves, nothing personal against Jake really, Alice just can't stand the smell of them, though she tries to keep an open mind, they are like us after all, they didn't chose what they are, it's fate. 003. Slow cars, seriously those are annoying even for humans. 005. When Bella lacks fashion sense, it just kinda gets Alice's goat. 001. I think Jake is a really sweet boy, but if I dare say that out loud the vampires near me would probably never let me live it down. 002. Alice shoplifted once in her life, but only because she didn't have time to checkout and the dress was amazing. She did go back the day after and pay for it. 003. Jasper used to be always hungry, it was a pet peeve about him. 004. Bella needs to dress herself better, its almost like she is unconcerned with outward appearances. 005. Alice still struggles with thoughts about actually killing James, but it needed to be done, it just gives me "daymares"
001. Losing Jasper - usually this fear is a silly one, but there's nothing worse than losing the one you love. 002. Losing the Cullens - for that matter, it would be bad to lose family too. 003. The Volturi - Fear that they will continue pursuing our clan. 004. Humans -What if they suspect us of moving all of the time? It's unlikely, but if someone catches on, what then? 005. Asylums - Alice was locked up in one as a child because of her premonitions and never really cared for them after. 001. Maybe someday they'll find a way to reproduce as a vampire. Alice really wouldn't mind having a child with Jasper. 002. Bella putting on a dress for no reason would make me happy. 003. Taking Renesmee to a baseball game, out of curiousity to see how a half-vampire plays. 004. Alice always wanted a small family (Cullen) vacation. We're always moving, but can't we just plan to go somewhere for fun? Like a rainy day at the amusement park or something? 005. Being a model, so that's kind of a weird dream. 001. Not being able to see werewolves, shape shifters, half-humans, or half-vampires in visions. 002. Being short sometimes becomes a hinderance. 003. Sometimes the future changes based on a persons decision. 004. Shopping, kind of a double edged sword. 005. Sunlight, Alice wishes she could go into it casually again, without having to worry about humans seeing her. 001. Alice is an exceedingly optimistic person. It's better to look at the glass as being half full than to look at it being half empty! 002. Also a very joyful and bubbly individual. It's a trait that makes Alice fun to be around. 003. Nearly always gets what she wants. Alice is kind of spoiled. 004. Alice is almost always happy. It's part of who she is, and goes hand in hand with bubbly and optimistic. 005. Politeness runs in her blood. Alice has a really hard time being rude to anyone. 006. Alice is a very gentle individual. She never wants to hurt others. 007. Wreckless at times. Like when she stole a Porsche. 008. Imagination runs in Alice's veins. Not to mention she has no problem being open about that. 009. A very trusting person. Alice almost always gives others the benefit of the doubt. 010. Alice is very extraverted. She enjoys being near people and activity. DADDY: Carlisle Cullen is the only father that Alice will accept, as her biological parents are deceased, and didn't accept her because of her premonitions as a human. THAT OTHER KID: Cynthia, a sibling she discovered when researching her family. COMMENTS? : I like how you guys are coming along, and wish you the best of luck. Alice had been spending the day thinking about when she was changed, she wanted to remember the events, but a lot of them seemed to be missing from her memory. Alice remembered waking up and how it took her several decades to realize that she was turned by a vampire working at a mental institution. She was in this institution because of her ability to see things. Others thought she was crazy. The vampire still believed Alice was not, though, and Alice does not remember this very well. Then Alice remembered seeing Jasper in a vision and immediately knew I had to find him. There was something about him...he was so scarred, so pained, so tormented. that Alice wanted to console him. She wanted to help him with whatever tormented him and ensure that he never felt pain again. She found him in 1948 and travelled with him for two years before we settled in with the Cullens. Alice had found them due to another vision, and couldn't shake the visions of Jasper and herself settling down with them. In 1950, we found the house and started our life as a family. Jasper and Alice married once. Rosalie and Emmett have done it several times, but Jasper and Alice never felt the need. He pledged his love to me once and once was enough. Alice truly believes it always will be. We live happily with our family and hope to live in such happiness for eternity.